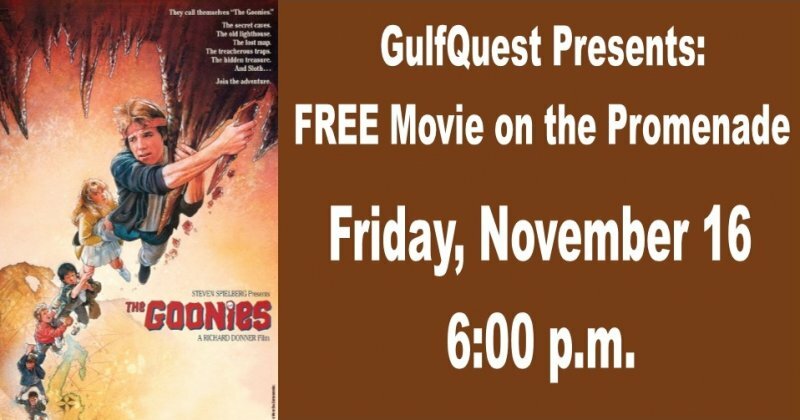 Grab a blanket or chair and join GulfQuest for a free showing of 'The Goonies' movie outside* on the Riverfront Promenade. Weather temps may be chilly so be sure to bring hats, gloves and blankets. Coming hungry after work? The Galley will be selling a variety of light concessions from 5:15-6 p.m.
**RAIN PLAN** Due to limited space, should there be inclement weather, the first 110 people who reserve a free ticket will be invited to enjoy the movie inside in our Riverside Room.